National governments are creating digital service teams at an accelerated speed. I have written about their approaches, team compositions, and outcomes in a report published by IBM’s Center for the Business of Government last year and expanded on it in this interview. My report mostly focused on the U.S. Digital Service Team and 18F, and highlighted some of the practices of the Danish Agency for Digitisation and its Mindlab, as well as the UK’s Government Digital Service and Team Digitale in Italy. Since I published the first report, additional service teams were created in 2017: the Canadian Digital Service, Finland’s D9 team, and New Zealand consolidated its IT operations into one new agency, Digital.Govt.NZ. This semester I am teaching a new seminar that focuses on a relatively new topic: The challenges that public administrations are facing when they are aiming to digitize their analog services. Under the catchy term “digital transformation”, many are looking to not only move from analog to digital, also redesigning, automating, or abandoning outdated administrative acts and the corresponding services. The term was adopted from the private sector, where digital transformation of products and business models started to occur with the use of the Internet as a distribution and communication channel. The tricky situation for public administrations however is that they can’t reinvent their business models, look for new customer segments, or abandon offline products/services. Unfortunately, public administrations are compared to those whose core business model was digital transformation of their own sectors, such as Apple’s iTunes platform, Skype replacing landline phones, Amazon transforming book/retail sector, Twitter as a newsfeed replacing traditional print newspapers, etc. We have very limited literature on the topic, therefore the goal of this seminar is that students are deriving research questions from expert interviews and are adding necessary insights by conducting additional interviews. I will give a short introduction to the topic, plus train them in qualitative data collection and analysis – with the hope that they will be equipped to design an interview guideline, select interview subjects, analyze, and present the data. 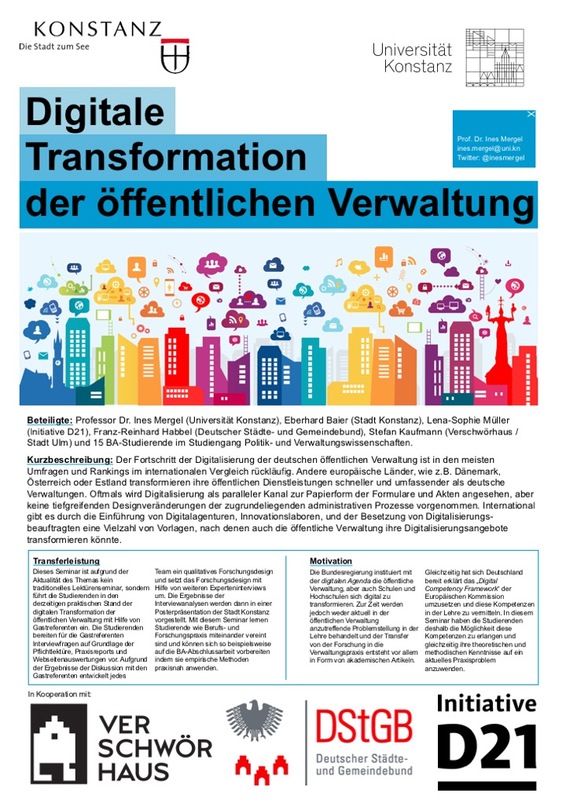 I was able to cooperate with four external partners for this project: the City of Konstanz, the Initiative D21 (responsible for Germany’s annual e-Government monitor), the City of Ulm’s Verschwoerhaus (an innovation lab), and the Deutschen Städte- und Gemeindebund. They will join us in person or via Skype, present a short introduction of their main problems and findings and then we will open up the conversation for the student-led Q&A. Finally, the students will design posters with their main findings – an alternative way of communicating research insights to an audience – and will discuss their findings in the Mayor’s office with civil servants who are interested in digitization. The project is supported with an internal grant to increase the transfer between research, teaching, and practice. This is an initiative that was requested by the student body and in my opinion an applied topic like digitization fits extremely with this mission. I am also hoping that the students are gaining valuable methodological and communication skills, will be able to ‘translate’ their academic insights in plain language to a larger audience, and will be generally best prepared for their BA theses and the job market. Mergel, I. (2016): Big Data in Public Affairs Education, in: Journal of Public Affairs Education, 22(2), pp. 231-248. Mergel, I. (2012): The Public Manager 2.0: Preparing the Social Media Generation for the Networked Workplace, in: Journal of Public Affairs Education (JPAE), 18:3, pp. 467-492. – Dr. Mergel: You’ve had a most interesting academic career; the convergence of academia and industry (and tech!) in your published works is incredible! What made you decide to commission a report on global digital services? We currently see all kinds of organizational arrangements emerge in government: innovation or policy labs, innovation offices, and digital service teams. My goal with this report was to understand how the bureaucracy can absorb new organizational arrangements and approaches and scale them up in government. The report focuses mostly on 18F – a digital consultancy that provides services to clients at all levels of the U.S. government. I also included a brief overview of similar international initiatives, like the UK’s Government Digital Service that served as the role model for 18F’s creation. – In your report, you mentioned global government digital service consultancies and agencies; 18F, GDS, and DTO. To level set with our readers, what are these organizations? What factors (specific or high-level) in aggregate lead to the rise of these organization types? And, how have they had a profound influence on society? 1. In the process of digitization, it is important that state and administration modernize their exercise of functions and fully utilize the opportunities of digitization. What, in your view, is the present state of administrative modernization and where is the potential of digitization being used in what manner? What are the success stories in Germany? What past successes can we build on? The level of administrative modernization and digitization of the public administration in Germany is continuously declining in recent years. While legislative measures, such as the Digital Agenda, privacy policies, or investments in broadband services are being advanced, it is difficult for the German administration to improve in the e-government rankings. In a global comparison, Germany was placed at number 17 in 2011 and fell in the United Nations World e-Government Ranking four places to No. 21 in 2014. Compared to the rest of Europe, Germany occupies the 20th place in the field of digital service offerings according to the 2017 DESI ranking. In comparison, the leading e-government countries, such as Estonia and Denmark, began their digital transformation of the public administration 10 years ago. Reasons for this are manifold. 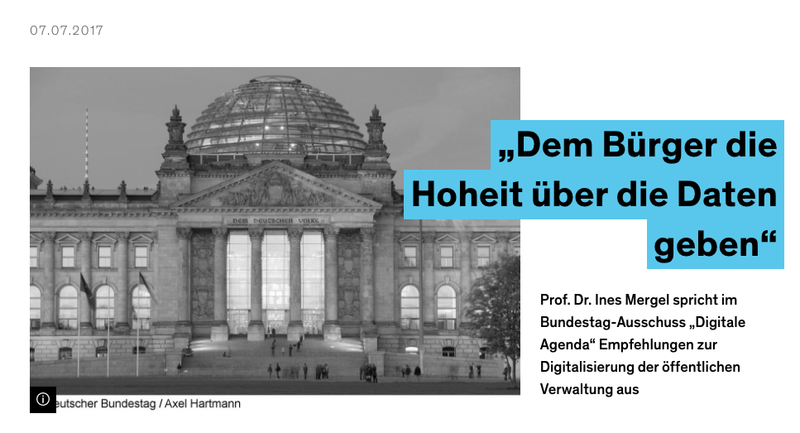 A McKinsey study to “E-Government in Germany – a Citizens’ Perspective” from 2015 shows, that the use of existing e-government services has stagnated since public administration digital services are not user friendly from a citizen’s perspective. According to the 2016 DESI study, only 19% of Germans use the online offerings of the public administration. This means that investment in e-government services fizzle out and bring no added value for citizens. IBM – The Center for the Business of Government has published my report titled “Digital Service Teams – Challenges and Recommendations for Government“. The report is part of a larger research project in which I work on understand how different countries are using start-up teams inside of government to move their public administrations toward digital transformation. I am currently working on three other country cases (Estonia, Denmark, and the UK) and will add more cases as funding becomes available. The insights provided in this report are based on a review of relevant literature and interviews with founding members, current directors, line managers of digital service teams, their counterparts in the offices of the Chief Information Officer (CIO) and Chief Technology Officer (CTO) at the agency level, and private-sector representatives aiming to collaborate with these new teams.The interviews focused on the structure of the teams, the use of agile and human-centered design processes, changes to human resource (HR) processes to attract information technology (IT) talent from the private sector, the incentives for IT professionals to join the U.S.federal government, and the changes made to federal IT acquisition processes. One of the catalysts that led to the creation of these various digital service units was the inability to deliver an operational HealthCare.gov website on time in late 2013, which was symptomatic of a broader federal challenge in delivering large-scale IT projects.A post-mortem assessment found that the government’s existing IT expertise did not reflect private-sector industry practices, and that there was a gap between the needs of program managers and the technical capacity available to implement large projects effectively.A key contributing factor was that over three-quarters of the current IT budget for the federal government is earmarked to maintain existing, outdated legacy IT systems, leaving little room to exploit the potential for adopting innovative, new technology approaches and capacities. A near-term solution to this lack of technical capacity and innovation skills was the introduction of so-called “IT start-ups” within government, also known as “digital service teams.” These small teams typically operate outside existing agency IT organizational structures and recruit IT talent directly from the private sector.They are given a mandate to rapidly implement change initiatives using commercially-developed tools and processes such as human-centered design and agile innovation management techniques—which are standard practice in the private sector, but have been infrequently adopted in the public sector. NextGov: Creating IT Start-Ups in Government, May 31, 2017. IBM The Center for the Business of Government: Creating IT Start-Ups in Government, May 31, 2017. FedScoop: Think Holistically about what digital services teams represent to government, June 1, 2017. GCN: When digital service teams hit innovation hurdles, June 1, 2017. Federal Times: Report looks at cause and effect of digital service teams in government, June 2, 2017.
diginomica blog: IBM – ‘Government needs systemic change, not just digital projects’, June 26, 2017. Huffington Post: Distinguished Professor Dr. Ines Mergel Explains How Global Digital Services Teams are Modernizing Government Tech, August 5, 2017. Mergel, I. (2017): Digital Service Teams – Challenges and Recommendations for Government, IBM – The Center for the Business of Government, Using Technologies Series, Washington, DC. IBM – The Center for the Business of Government has announced a new round of winners of their research stipends. I won an award to write about my research on digital service transformation in the U.S. federal government. The Center for The Business of Government continues to support reports by leading thinkers on key issues affecting government today. We are pleased to announce our latest round of awards for new reports on key public sector challenges, which respond to priorities identified in the Center’s research agenda. Our content is intended to stimulate and accelerate the production of practical research that benefits public sector leaders and managers. In 2014, the White House created the U.S. Digital Service team and the General Services Administration’s 18F group. Both groups are using agile software development processes to design and implement high-profile software projects. The results of this report include lessons learned during the scaling up efforts of digital service teams across the departments of the U.S. federal government. These will focus on managerial design aspects, organizational challenges, motivations of digital swat teams and their department-level counterparts, as well as first outcomes in the form of digital service transformations in each department. This research report aims to support the presidential transition team’s efforts by outlining the current efforts of scaling-up digital service teams and their lessons learned, as well as observable outcomes of digital service teams across the U.S. federal government.